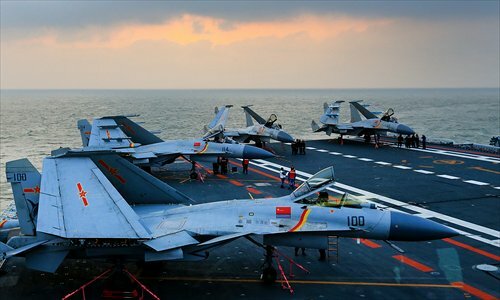 China's first aircraft carrier, the Liaoning recently left its shipyard in Qingdao, East China's Shandong Province, to start a new training mission, as the carrier's political commissar confirmed it is constantly prepared to fight against enemies. Senior Captain Li Dongyou, the political commissar of the Liaoning, told the Global Times on Monday that "as a military force, we are always combat ready and our combat capacity also needs to be tested by war. At this moment, we are doing our best to promote our strength and use it to prevent war. But we are preparing for actual combat at any time." The Liaoning, the first aircraft carrier commissioned into the People's Liberation Army Navy (PLAN) Surface Force, has previously been described as a "surface platform" for tests and training by the PLA's official media, but now has been formally described as having a real combat capacity. "As a combat platform, China still lags behind the US in technology and capability to execute missions, but three senior US officials who visited the Liaoning before all gave a positive evaluation on the management of the carrier - officers and soldiers' daily lives and training are well organized and the equipment maintenance is fine," Li said. "There are more than 1,000 non-commissioned officers (NCOs) on the Liaoning, and they are the main part of China's aircraft carrier. Among them, we have 42 Chief Petty Officers with an average age of 40 and experience of serving in the navy for more than 20 years," Li said. "Weaponry is the key for combat capability on the carrier. As China's first generation of NCOs on the carrier, these officers' capability on how to operate, repair and maintain equipment is irreplaceable. And they are the source of our confidence," Li said. Apart from training and conducting mission, soldiers and officers aboard the Liaoning also have a modernized and comfortable living environment as the crew are "very hard- working and lonely on the sea during the mission," according to Li. Li also pointed out that they planned to arrange a Wi-Fi signal on the carrier to help soldiers and officers contact their families via mobile phone when ashore.